welcome in ireon -karin and nikos rent out rooms with sea view! We (Karin and Nikos) rent out rooms in Ireon. 5 lovely nice price/quality rooms with sea view. To rent all year. The rooms have air conditioning, shower, a seat and mosquito mesh protection. Balconies with seat looking out the over sea. Where you can see the fishing boots going out to catch you daily meal. Our house - your room: be welcome ! Our house is situated in the beautiful village Ireon, just a few meters from the sea. Here we rent out rooms (5) and we run a â€œKavaâ€� (a kind of liquor store). In our â€œKavaâ€� you can buy, except from your drinks (try the lovely Samos wines), also the local products of Samos. The surroundings are marvelous, either if you want to enjoy the nature by making a long walk, maybe through the wine yards (from where the famous Samos wine comes), the olive fields or along the long beach enjoying the sound of the sea. The beaches in and around Ireon are very nice, because the waves are very small and located in the south of Samos, the climate is very mild. Of course, Ireon has its part of tourism with a night-club and bars, but also the traditional part has remained. 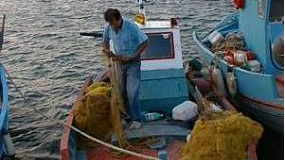 Especially at the small harbor, where the fishermen repair their fishing nets the time they come back at noon. In the evening youâ€™ll enjoy your fresh fish meal at one of the small taverns.